It was announced last week that Spotify is acquiring two companies in the podcasting space, Gimlet Media and Anchor. These acquisitions will have massive implications on the audio industry and for advertisers attempting to reach younger listeners. Ben Thompson of Stratechery wrote about the Spotify acquisitions this past Friday, and spoke at length about it on his Exponent Podcast. Both are worth checking out as they cover this move in much greater depth, but here's how I believe it will impact content creators and the advertising universe. Spotify is largely responsible for saving the music industry. Instead of fighting back against the internet, Spotify embraced the internet and discovered that value could be delivered through convenience. That is, even though you can still technically pirate music, it’s worth a $9.99/month subscription to have a massive music library at your fingertips. And if you’re not willing to pay for Spotify premium (as about half of Spotify’s user base has decided) an ad-supported platform is still more convenient than the illegal alternative. Spotify’s success has helped initiate revenue growth for the entire music industry, but Spotify itself has not seen the gains that should be associated with such massive disruption. They are the thankless savior… a dark knight, even. The reason being is that Spotify has remained a distributor within the music industry and has failed to gain significant influence on supplier activity. They have failed to gain control over multiple levels of the value chain, a hurdle that traditional tech unicorns have overcome on their path to dominance. The primary investment for most traditional tech unicorns includes fixed costs of R&D, sales and marketing. However, Spotify’s primary costs are driven by marginal fees to record labels. 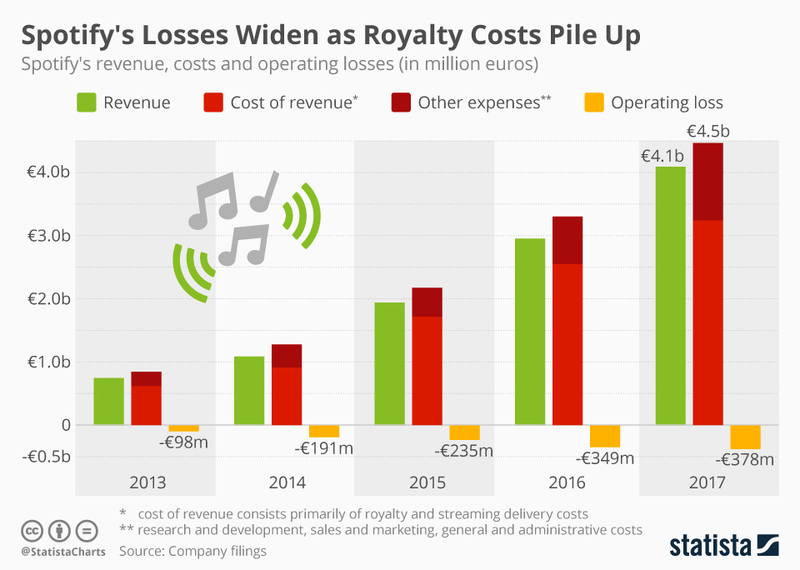 In 2017, Spotify spent an astonishing 3.9B, or 79% of their revenue, on distribution and royalty expenses (via Statista). As Spotify earns more revenue from users, the record labels earn more revenue from Spotify. It’s a cycle that limits long term potential. It’s unlikely that Spotify will be able to disrupt the supply-side of the music industry in a way that would remove the constraints from the record labels (I’m sure they have attempted to do this several times over… Spotify Session albums certainly come to mind. But none of these efforts have been successful). However, this constraint does not exist for the broader audio marketplace, where a dominant, central figure currently does not exist. Thus explains Spotify’s investment in the podcast market. In order to truly grow and earn the types of profits that tech disruptors typically reap, Spotify must transition to become what Ben Thompson refers to as an Aggregator. Thompson’s aggregation theory is used to explain companies that control multiple levels of the value chain (supply, distribution, and end user experience). Aggregators create winner take all scenarios in their verticals. There is only one Google, one Facebook, one Airbnb, one Netflix. Level 1 Aggregators control supply and distribution (think, Netflix). Exclusive content, massive library and overall convenience drives demand from end users, the last piece of the value chain. Level 1 aggregators must invest in acquiring their supply. Level 2 Aggregators control distribution and the end user experience (think, Uber). Uber promises the best experience for the end user, and therefore generates massive demand. Suppliers (drivers) are therefore incentivized to opt into the platform to match the demand. Level 2 aggregators incur transactional costs of onboarding new suppliers on to the platform. Level 3 Aggregators do not own supply, and incur no cost for onboarding a new supplier. Google is the best example of a Level 3 aggregator, and benefits from such a massive end user base that the entire industry of SEO exists to help companies become a supplier of content on Google's platform. A Superaggregator would be Facebook, where Users serve as both end users and in many cases, suppliers that publish content. What separates a Superaggregator from a Level 3 aggregator is that the content created by supplies exclusively lives within the platform. Spotify’s investment in podcasting is the first step in becoming the primary Level 1 Aggregator for the entire audio industry, or to put it simply, their first step in becoming the Netflix of audio content, and they are doing so by heavily investing in the under-served market of podcasting. The entire podcast industry earned about 300M in 2017, compared to 8.7B earned by the music industry. 8.7B in revenue… and that is specific to the purchase of music and does not reflect concerts or any other music related events. Paid streaming services such as Spotify contributed 40% of this revenue last year, up from 30% in 2016. From an advertising perspective, Spotify earned 616M in ad revenues alone (more than twice earned by the entire podcasting industry), with only half of their customers using the ad-supported service. It’s safe to say that the music industry should be earning more than podcasting, but these numbers suggest that the market cap for podcasting is just 3.4% the size of music. 1/6 of Americans listen to podcasts on a weekly basis. 43% of podcast listeners listen to at least 6 hours per week. Overall consumption continues to grow, particularly with women, whom increased podcast consumption 20% year over year. It’s safe to assume that the podcast market is not earning nearly as much revenue as they are providing value, and therefore presents a massive opportunity for a company like Spotify to make a splash. Podcasting is also a complicated mess that would benefit from a centralized, dominant and user-friendly platform. Content creators (suppliers) would benefit from having a location where it is easy to produce and distribute podcasts, and also to find potential advertisers as a way to monetize their content. Advertisers, on the other hand, are desperately trying to find podcasts to advertise on. I get these questions from clients all the time. But unfortunately, ad placements on popular podcasts are only accessible through third-party media buyers like Midroll, and the smaller niche podcasts are nearly impossible to sort through and/or develop relationships with. This is the exact scenario that lead to the development of programmatic ad exchanges. And that’s what I envision Spotify becoming. However, Spotify still needs to earn their seat at the aggregation table before they can act as the dominant audio platform. Apple is currently the platform leader in the podcast space, but has not made much headway in improving user experience or monetizing the channel (and they haven't made much attempts in either arena). Apple views their podcasting platform as one part of the suite of channels that are accessible through Apple. If Apple makes it convenient for their users to access all kinds of media through their product suite, then they have added value and will retain loyal customers. But there is nothing particularly unique about the Apple Podcast app, which paves the way for an alternative to provide value in addition to just convenience. Stitcher and Overcast are two podcast platforms that have attempted to add value beyond convenience, but the main selling proposition for both platforms is the ease of use. I am personally a fan of Overcast, particularly their Smart Speed feature, which automatically skips over silence and reduces the amount of time required to listen to a complete episode. One thing that Apple, Stitcher and Overcast have in common that Spotify does not is the ability to increase playback time to 1.5x or 2x. This is a must-have feature for many podcast listeners and is frequently requested on Spotify's forums. But even with increased convenience and playback features, no one in the podcasting space is effectively using exclusive and premium content as their key differentiator. Spotify is doubling down on this opportunity as part of their aggregation play, and the resulted impact will provide much greater value to end-users than other platforms are currently apply to offer. To become a Level 1 aggregator, you must first acquire supply. Gimlet Media produces a slew of extremely popular podcasts including ReplyAll, Crimetown, Science vs., and StartUp. Homecoming, an Amazon Original series starring Julia Roberts, was originally a Gimlet podcast starring David Schwimmer (and, to my knowledge, was the first widely-popularized fiction podcast). Alex Blumberg founded Gimlet Media after helping create podcast behemoths This American Life and Planet Money. The very first Gimlet podcast, StartUp, was a podcast about Blumberg starting his own podcasting company. Extremely meta, but also very good. Zach Braff starred in an ABC produced sitcom spin-off of StartUp called Alex, Inc. It, um, wasn’t great. Coming up with creative ideas for new kinds of shows that have never been done before, such as Homecoming. Explored creative solutions to advertising. It’s much too easy for users to skip through most podcast reads, and Gimlet has constantly looked at ways to ensure that advertisers are actually able to reach listeners, including sponsored content and native reads. Inspired a very loyal fan base, many of which subscribe for premium content. Cut their losses with under-performing shows. Spotify will likely make Gimlet content exclusively available on Spotify’s platform. Existing fans of ReplyAll will therefore need to make an immediate change in the way they consume that content. In addition, Spotify hopes that users will habitually use their platform to consume other podcast content (assuming they don’t already listen to podcasts on Spotify… I don’t know anyone that currently does). Extremely-loyal fans of ReplyAll will even sign up for Spotify if they are not already members. In addition to the benefits of existing assets and fans, Spotify is able to leverage the great talent that Gimlet seems to possess in hopes to create new creative ideas and exclusive content that will drive growth in the long run. But Gimlet is just one supplier in an extremely saturated market place. Surely Spotify cannot be betting on Gimlet’s content alone as part of their strategy to become the audio aggegator, right? Anyway, Anchor does exactly what their headline/subhead says: They provide an easy-to-use platform for creating podcasts. Soon, I imagine that this will be heavily rebranded to speak about how Anchor is the easiest way to get your podcast published on Spotify, and other podcast providers. I expect that podcasters will still be able to distribute their content to iTunes and other podcast platforms (otherwise they won’t use Anchor altogether), but it will be even easier to get your podcast up on Spotify. Spotify can also leverage their internal advertising platform to reward podcasters that exclusively offer their content on Spotify. And so the cycle continues… on and on, until Spotify has successfully become the Audio Aggregator. In the not-so-distant future, when the dust settles and Spotify has solidified themselves as the dominant leader in the audio marketplace, most end-users won’t really notice the difference. Suppliers, as in the creators of audio content, will have had their world turned upside down. Traditional incumbents will have been forced to change their ways, either by opting into Spotify’s platform or by remaining independent and relying a small niche of loyal fans to [hopefully] drive revenue. Spotify will focus on developing their own content, similar to the Netflix Original Series Collection, but also garner exclusive content that was produced elsewhere. Tools like Anchor will make it even more lucrative for content creators to burst into the podcasting space. Many content creators will be incentivized (through advertising/monetary incentives and overall convenience of a centralized platform) to exclusively host their podcasts on Spotify. Slowly but surely, Spotify will replace Apple as the go-to for hosting and sourcing podcast content and will have developed massive influence over each level of the value-chain. Similar to how YouTube creators have exploded as a result of increased supply of YouTube advertising revenue, I expect to see the same take place for audio (get ready for your ASMR podcasters that earn millions in revenue…). I expect Spotify to acquire a handful of other podcasting platforms, with the goal of leveraging existing technology and user data, but also to eliminate competition. Overcast, for example, would be an interesting acquisition target that would allow them to integrate the Smart Speed technology into their playback functionality. Other podcast platforms like Stitcher will need to pivot into a niche ("the go-to platform for true-crime podcasts!") or they will become completely irrelevant altogether. I also expect Spotify to develop technology that inhibits the ability to skip through advertisements, similar to what we currently have on YouTube. This will be met with massive public backlash, but we'll all get over it (and Spotify will gain more premium subscribers as a result of the change). Advertisers will be much more willing to invest in audio if they can be certain that their ads will actually be heard. I’m curious to see how this might affect the music industry. If podcasting continues to grow in relation to music and if Spotify continues as the best platform to stream music, then it is possible that Spotify will acquire such a significant percentage of the overall market that they would have bargaining power over the record labels. The Spotify self-service advertising platform will become as robust as the Facebook’s, complete with retargeting / conversion pixels, interest-based targeting and more - all backed by powerful machine learning algorithms. And any advertiser will be able to bid for a placement on the Bill Simmons or Joe Rogan podcast, regardless of their overall budget. Audio advertising middlemen, such as Midroll, will either go away altogether or will pivot into offering broader-scope advertising solutions. Advertisers have a lot to be gained by this move, as the audio landscape provides massive opportunities that are currently not accessible or scalable with the current landscape. Spotify recently made massive upgrades to its self-service ad platform, and even though it is far superior to ad placement opportunities on Pandora or other platforms, it is still quite limited. Study after study shows the value of audio advertising and the impact that it has on brand recall. It is extremely effective in developing a brand presence, but it has lacked sophistication in driving direct-response sales, which is where most marketers want to spend their money. 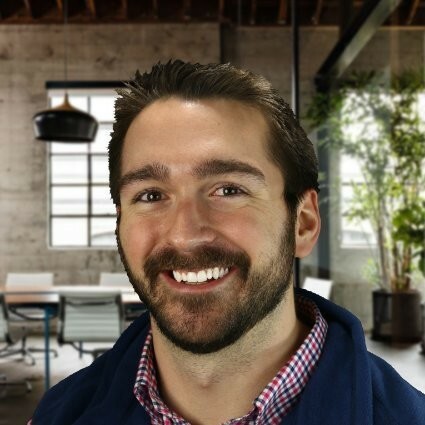 Direct-response marketing relies on proper attribution models, and attribution relies on tracking pixels and cross device capabilities. This is exactly the issue that can be solved by consolidating into a central ad platform like Spotify. Users are logged into Spotify on every device they own… at work, at home, and everywhere in between. It won’t be long before advertisers are able to profitably bid on hyper-targeted placements through Spotify’s ad platform, unlocking a treasure trove of branding and direct response opportunity. And as both an advertiser and a Spotify end user, I am pretty excited about that.